Chris Hughton applauding the Brighton fans after the FA Cup Semi-Final defeat. Image courtesy of Mike Hewitt on Getty images. Brighton manager, Chris Hughton was full of praise for his players after their performance in the 1-0 defeat to Manchester City in the Semi-Finals of the FA Cup. 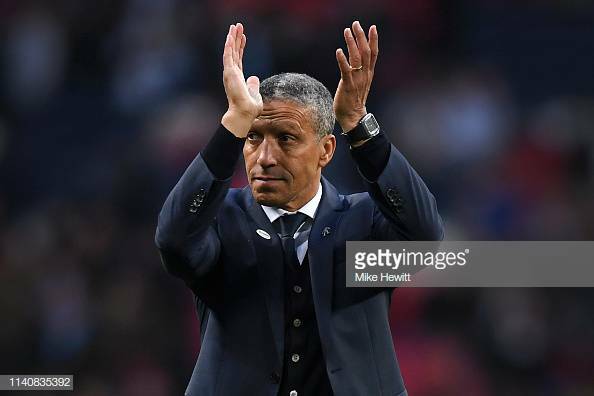 Hughton spoke to Seagulls.co.uk and said: “I’m incredibly proud of the players. After conceding so early, I doubt there was anyone in the stadium that felt a second [goal] wasn’t going to come. “Apart from the goal, I’m struggling to think of a real clear chance they had inside 90 minutes, and that certainly wouldn’t have happened too often to them this season. Hughton also highlighted how much of an effort his side put in to run Manchester City so close: “When we analyse the game and what our players did, the distances they covered, one thing I’m quite sure about is that it will be as high as it’s been at any stage this season. One of the biggest talking points of the game was when Kyle Walker appeared to headbutt Alireza Jahanbakhsh and Hughton thought he should have seen red rather than yellow: “At the time I didn’t know, I was too far away to see, but I’ve seen it a few times since and I do think it should have been a red card. “We ask for players to be honest, and I’m quite sure if Alireza goes down clutching his head, for that moment there would have been a different outcome. “You have to look at the action — the heads are together, and what I do accept is that there isn’t distance between them, so in regards to him hurting Alireza, that wasn’t the case. “But if you’re looking at aggression from one player to another, then that certainly would have been a red card on other occasions."